While your birthday is not until Monday, I wanted to make sure that I posted your birthday wishes early. Happy Birthday my little boy! Re: Happy 5th Birthday Holden! Awwww Happy Birfday Holden! You look so handsome in your hat!! Aww Holden you look so cute in your hat!!! Happy 5th birthday big boy!! HAPPY BIRTHDAY HOLDEN! 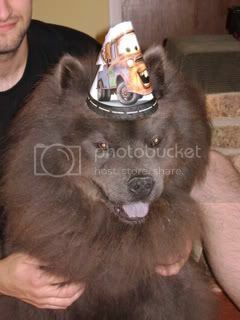 5 YEARS OLD, WHAT A BIG CHOW CHOW YOU ARE!! Happy Belated Birthday Holden, what a big boy your are and so cute in your party hat. Happy belated birthday Holden. Hope you had a good day and got spoilt rotten! HAPPY 5TH BIRTHDAY SWEET HOLDEN~~~Love your hat!! !